It seems like every spring there is renewed coverage of a partial skeleton that was found on the island of Lazaretto Nuovo (one of two 15th-16th century leper colonies near Venice) in 2009. I've never covered it here, but since I was alerted to an airing of a documentary about the skeleton on Italian TV this week, I thought it may be time to track the progress of the so-called Vampire of Venice ("il vampiro di Venezia" in Italian, and not to be confused with a similarly named Dr. Who episode). During the 16th century, as plague raged around Europe, many people were buried hastily, in mass graves. Without modern forensic knowledge, people didn't understand how the body decomposed. For example, as the bacteria present in the gut start consuming the internal organs, fluid can be produced and chest cavities can bulge and sink, making the bodies seem to sigh; as the skin dries out and recedes from the fingernails, they can appear to grow longer; and as the muscles go through stages of rigor mortis, bodies can seem to move. Mass plague graves were often reopened to inter more individuals, so seeing corpses that had changed since burial confused and scared the living. Using carbon and nitrogen isotope analysis of a bit of postcranial skeleton, anthropologists discovered that she ate a lot of vegetables and grains, likely a lower-class diet. I'm assuming from reading between the lines of the NatGeo article that C/N isotope analysis of a rib was done, which would have given them information about the protein component of the diet and thus told them that she didn't eat a lot of meat or fish. Since it wasn't remarked on and since DNA analysis said she was European, I'm also guessing the C isotope analysis revealed C3 plant consumption (wheat and barley, e.g.). The discovery of a skeleton of an older female in a 16th century Italian plague cemetery with an anomalous burial practice that correlates to superstitions about disease and the occult is extremely cool, whether or not she was "il vampiro di Venezia". Italian archaeologists and anthropologists are learning both about the biology of plague victims and about their cultural explanations for disease prior to modern germ theory. 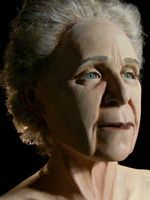 The analysis of this individual is an excellent example of using historical records and biological remains to understand what life was like centuries ago. I wish that National Geographic hadn't resorted to the "Vampire Forensics" title and that they hadn't resorted to blatant pandering and sensationalism in making the documentary, because there is some very good science behind the story. But perhaps it's the marriage of vampires and forensic science that explains why this story keeps surfacing in my news feed and why friends and colleagues keep sending me links to it. Footnote (7/2/12) - Since I originally wrote this post, a bit of an argument has been kicked off in the academic literature about this burial. The discovery was published in 2010 in the Journal of Forensic Sciences by Nuzzolese and Borrini, although the article seems to be a conference paper rather than a full-length explication of the find. It's in this brief communication that Nuzzolese and Borrini lay out their argument that the community may have thought of and treated this woman (at least in death) as a vampire. A few months ago, another group of Italian bioarchaeologists, led by Simona Minozzi, wrote a commentary about this also in the Journal of Forensic Sciences. In essence, they argue that the brick in the mouth, the misaligned collarbones, and other aspects of Nuzzolese and Borrini's case are simply taphonomic - that is, normal processes that happen by chance after death and burial. They also take issue with Nuzzolese and Borrini's interpretation of the historical record as well. Minozzi and colleagues don't buy the vampire interpretation at all, and go so far in this LiveScience article as saying that Borrini is making it up to bring more attention to the perpetually underfunded state of Italian bioarchaeology. I don't know if Minozzi or others have been able to take a look at the skeleton itself, but I'm not sure it would help since most of the vampire interpretation lies in the context of the burial rather than in the biological elements. And as we all know, as soon as you excavate something, you destroy the context forever. We may never solve the mystery of whether or not this woman was considered a vampire, but the arguments about the interpretation indicate that researchers need to be meticulous and seek additional input from knowledgeable colleagues before committing on paper to an interpretation as dramatic as "vampire." That is very interesting of how her skull was found with a brick in it. i have never heard of a brick as a supersitous protection from vampires. I agree that the title "vampire forensics" is an unscholarly title, but with people's obsession with vampires i guess they thought that the title would make the documentary more appealing to the populace. Just started watching the Natgeo documentary. The introduction about the 'creature' is pretty disrespectful. Natgeo shouldnt have to resort to this. Im glad I dont watch natgeo! I hope it gets better, looks very interesting! My last comment was a bit jumbled, and I was surprised by the documentary. 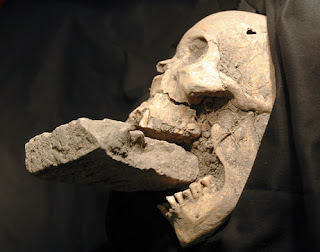 Getting back to the 'Vampire of Venice', should the occlusal teeth of the mandible and maxilla show striation patterns from the brick, or damage to the crowns and cusps? I didnt see this mentioned in the documentary (I'll admit I was half watching!). As its likely post mortem, is there damage to the TMJ, indicating whether the mouth would still have flesh/enough muscle attachments on it? anyway these are just comments from a novice! its a great integration of archaeological sciences and historical records. Also, I just want to say that the blog is great, thank you! Thanks for your comments, David. I didn't watch the whole thing myself (I hope the middle part was better than the beginning and end, which I did watch). I think it's possible for a body buried in this way to have damage to the TMJ if the mouth had been forced open. But I think it's more likely (at least, if the rumor about the burial method is true) that the corpse was decomposed enough that the mandible was hanging slack - a very common position for the skull to assume after the soft tissue loosens up. The undertakers then may have been scared of the "vampire" opening her mouth and simply dropped a brick in it and covered her back up. This is a very interesting film and great review.. This is very interesting review. I will watch the documentary..